I entered my local multiplex being aware of all this and was afraid of what I was going to see. To be honest, I could agree with all of those negative opinions, watching the film from a perspective of people who didn't like it and being aware of their expectations and attitudes. I am of the opinion that the missed expectations and attitudes toward the movie, screenwriter, and director were behind many of the negative opinions and led to the flop. It is worth putting this production in a wider context of other works about Steve Jobs' life that were released in recent years after his death. These works started with the official biography by Walter Isaacson and "Becoming Steve Jobs" by Rick Tetzeli and Brent Schlender - a great study of forging a top business leader from a chaotic, self-centered and selfish hippie - and ending with films like "Jobs" by Joshua Michael Stern (starring Ashton Kutcher) and the documentary "Steve Jobs: Man in The Machine". Both books were a deep analysis and detailed description of his life, or at least part of it. Both are a compendia of knowledge about Steve Jobs and his life, painting his psychological portrait and describing how he was changing. To me, Joshua Michael Stern's movie was kind of an illustration to the official biography. It faced massive criticism, for sure, but despite some details known mostly to people pictured in that film, it stuck to the events as they were described in the biography. Comparing both the Stern and Sorkin films in terms of accuracy and sticking to facts reveals that the latter movie comes out badly. Another important point was the acting of Ashton Kutcher, who became almost a dead ringer for Steve. Over the last two or more years there was a lot of news about the support that Aaron Sorkin got from Walter Isaacson, Steve Wozniak and even from Lisa Brennan-Jobs, Steve Jobs' first daughter. All that buzz suggested that the movie was going to be presenting the life of Steve Jobs in an honest and accurate way and that expectation was built up in the media. Although the movie was going only to show a few important moments in the life of Jobs — just before showing of first Macintosh, NeXT Cube and first iMac — almost everybody expected they would be presented honestly with deep attention to details. Another important factor was the expectation towards the screen writer - Aaron Sorkin - who was well known from writing the screenplay for "The Social Network", a film portraying Mark Zuckerberg and the beginning of Facebook. Fans and foes of Apple were waiting for another film of this type and "Steve Jobs" definitely was no. Indeed, both those who liked and despised Jobs could feel disappointed in the movie. Facebook is in many ways much more personal to people than Apple, and it has more users than all Apple products do. Even people who don't have Facebook accounts know the service and its founder. I would say that people know Apple less well. They know who Steve Jobs was, but it is Facebook they are logging into every day no matter what kind of device they use. And to be even somewhat brutal, Mark Zuckerberg is still alive, and Steve Jobs passed away four years ago. So audiences were attracted to theaters to see the story behind the service they are spending their lives on or to affirm their belief that Facebook is evil. "Steve Jobs" is something completely different from the expectations people had for the movie. The life of Steve Jobs and the biography based on it is only an inspiration, and the screenplay is only loosely based on facts. For example, it’s worth mentioning Joanna Hoffman (the daughter of famous Polish film director Jerzy Hoffman). She worked for Apple and Steve Jobs for just a few years as a PR person on the original Macintosh team. In the movie Hoffman - portrayed by Kate Winslet - assists Steve Jobs from the first Macintosh presentation, through the NeXT episode and ending with the introduction of first iMac. Sorkin turned Hoffman into just a fictional character. In all of those important moments, Jobs did have a PR woman next to him but first it was Joanna Hoffman, then at NeXT it was Allison Thomas and finally, after his return to Apple it was Katie Cotton. Sorkin was apparently inspired a lot by how Allison Thomas dealt with Jobs. However, this film is for people who won't be complaining about details like how long Hoffman was actually Jobs’ PR person or if those scenes with Wozniak, Hertzfeld and Sculley actually took place. In this case the facts are a distant second, for this film is a psychological drama portraying a person who is both chaotic and perfectionist at the same time. Jobs was a person who rejected and hurt all the people that were close to him, but they are not going to efface themselves and go out of the camera frame. On the contrary, they confront his selfish, self-centered ego. The fictionalized characters of Steve Wozniak, Andy Hertzfeld, Lisa (Steve's daughter) and her mother Chrisann Brennan, and John Sculley are in fact a mirror that the main character looks into, and he does not like what he sees. The movie “Steve Jobs” is not just a psychological portrait of the main character, as it is not only Jobs who at the same time rejects and needs the people who are around him. Those people need him as much as he needs them, and this is the kind of relationship that those people can not break. Aaron Sorkin tries to deal with the quite common opinion that Steve Jobs created no single thing and that he used or exploited others, their great ideas, and their hard work (as an example, the fictional scene with Wozniak before the NeXT introduction). 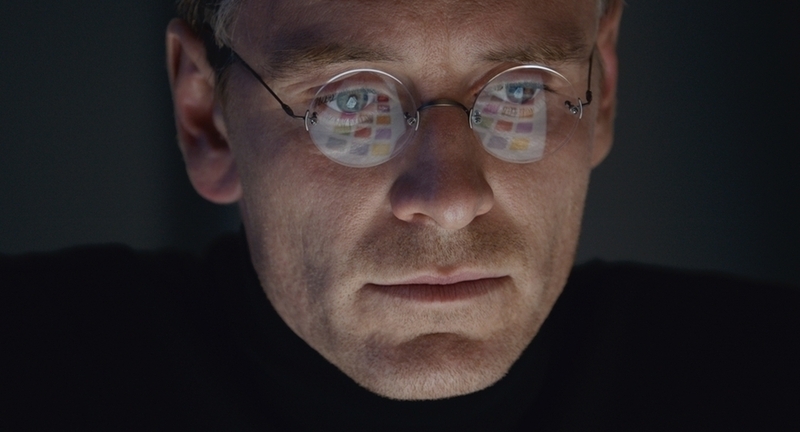 Michael Fassbender’s physical resemblance to Jobs is not an important factor, and he is great as a fictional Jobs. I say fictional, since this film is not about the real Steve Jobs but just an artistic creation. In my opinion this is why the movie failed, and I can understand the complaints of people who knew the real Jobs, including his wife. Sorkin did with the story of her husband what he wanted to do. I am of the opinion that Sorkin's screenplay would be an excellent theater production. In fact, while watching this movie in an empty cinema I felt like I was in a theater with a real stage and live actors in front of me. I would love to see this story on stage with almost no sets, just the empty, dark stage, the actors, and a table with a Mac on it.